According to a new market research report published by Credence Research, “Zero Turn Mowers Market(By Engine Power (30 hp), By Power Source (Petrol, Diesel, Electric/Battery-operated, Others (Hybrid, Propane-based, etc. )), By End-use (Residential, Commercial, Government & Municipal, Sports, Others (Education, etc. 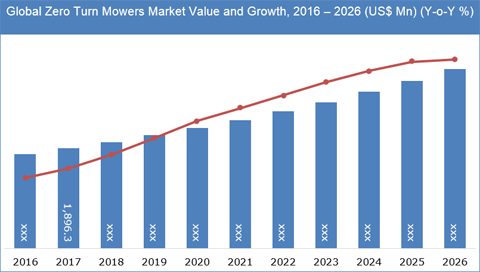 )), By Geography (North America, Europe, Asia Pacific, and Rest of the World)) – Growth, Future Prospects, and Competitive Landscape, 2018 -2026”, the global zero turn mowers market was valued at US$ 1,896.3 Mn in 2017 and expected to expand at a CAGR of 7.3% during the forecast period from 2018 to 2026. Lawn mowers are gardening tools used for cutting grass at desired height/length and thereby maintain or decorate lawns, gardens and yards. A zero-turn mower is one that navigates using rear wheels and delivers unparalleled speed with maneuverability for cutting medium to large lawns. A zero-turn mower is designed in a way that it is able to cut closely around obstacles, thereby eliminating need for trimming. One major advantage with zero turn mowers is that they pivot through 180 without leaving a circle of uncut grass. Growing popularity of urban gardening, especially in developed economies like North America and Europe is identified as one of the major factors driving zero turn mowers market. Government regulations promoting lawn maintenance and consequent expenditure on gardening bodes well for the market growth in North America and Europe. Advancements in technology have led to the introduction of several state-of-the-art variants with unique features. These developments have been instrumental in driving the uptake of zero turn mowers globally. Growing inclination towards cleaner and zero-emission lawn mowers is one of the major trends observed in the gardening industry. Thus, uptake of electric and battery-operated zero turn mowers among consumers has increased considerably over the last few year, benefitting market growth. On the contrary, matured nature of the market coupled with limited potential for further product innovation is likely to limit the growth of the zero turn mowers market worldwide. In addition, with the emergence of sharing economy, the inclination of consumers to rent rather own zero turn mowers will impact volume sales of new mowers during the forecast period. Some of the leading manufacturers profiled in the study include John Deere, The Toro Company, Husqvarna Group, MTD Group, Ariens Company, Briggs & Stratton Corporation, Kubota Corporation, Robert Bosch GmbH, Textron, Altoz, and GGP Group among others. The matured nature of the market has compelled manufacturers to focus on product enhancement in terms of productivity, efficiency, convenience, and flexibility. In addition, manufacturers are also working on extending the engine life and incorporating additional safety features to make the lawn mowing experience more safe and efficient for customers.